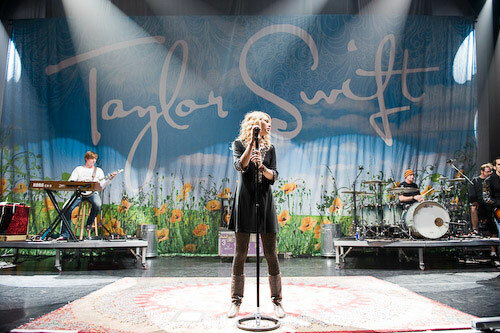 Taylor promoted her debut album by performing as an opening act for several major country artists' concert tours. She opened for Rascal Flatts on several dates, from October 19 to November 3, 2006, included on the "Me and My Gang Tour" (2006–07), performing a total of five songs from the album. She also served as opening act on twenty dates for George Strait's 2007 "United States" tour, and selected dates for Brad Paisley's "Bonfires & Amplifiers Tour" (2007–08); Taylor served as an opening act during all 2007 legs of the tour. During mid-2007, Taylor engaged as the opening act on several dates for Tim McGraw's and Faith Hill's joint tour, "Soul2Soul II Tour" (2006–07). Taylor again opened for Rascal Flatts for their "Still Feels Good Tour" in 2008. In addition, Taylor performed six songs from "Taylor Swift" on her first headlining tour, the "Fearless Tour" (2009–10). In the midst of her own tour, she began opening shows in select cities for Keith Urban on his "Escape Together World Tour" in 2009.